What does this mean? If you’re applying for a Customer Service Supervisor job, and you’ve had some leadership experience in other customer service roles, you should absolutely share that! That’s much more relevant than leadership on a sports team, in school, etc. So always go with what’s most relevant first! Recent experience beats older experience, if everything else is equal. So when you share some of your leadership experiences, pick things that are recent whenever you have a choice. Along with thinking about which of your experiences are most relevant and recent, you need to think about how impressive something is overall. Leading a large number of people is impressive. Leading a complex project is impressive. Handling multiple projects is impressive. You get the point. So also think about the scale of your past leadership, and the challenges involved, and try to share examples that are most challenging and have a “wow” factor. So to give the best answer possible, you want to combine the three points above, and then be specific. If you have previous work experience, use the STAR method- “situation, task, action, result”. What was the situation you were in? Was it school, a recent job, or something else? How many people did you lead, and who were they? Next, what was the task? What did you need to accomplish or what problem did you face? After that, talk about the action you took and how you led. What were your options, which did you choose as a leader, and why? And finally, conclude your leadership experiences by talking about the RESULT. That’s most important. How did things turn out? And what did you learn from it? How did you use this experience to improve and how will you use this knowledge to perform well in this job you’re interviewing for! Maybe you just graduated school, or you’re applying for your first job. You might not have work-related leadership experience. That’s okay. Just pick the most relevant leadership experiences that you can think of. Do the best you can with the example you prepare. Nobody’s perfect, and nobody has every single thing an employer wants in the interview, so you just need to prepare the best you can and give the best example you can when responding to the question. And if the STAR method isn’t working (I’ve seen people struggle to use it if your example of leadership experience is from sports, etc. ), make it simpler and just focus on the situation, and what you learned from it. What was the goal, and how did you help accomplish it through leadership? And how did you improve and develop as a leader? Always show what you learned at the end! That’s one of the keys to answering this type of interview question. Now that you know what to include in your answer, let’s look at a few examples. I’ll give an example for a recent graduate without work experience, and then for somebody who has work experience already. I just finished my degree in Finance, and most of my classes during my final year involved teamwork. I try to step up as a leader whenever possible, because it allows me to develop skills in communication, delegation, and managing multiple tasks and deadlines. In a senior-level Accounting class, we were broken off into teams of four and had to complete a large project throughout the entire semester. My team ended up getting the highest grade in the class because I set a schedule early in the project and delegated tasks to people based on their strengths. I enjoy leading and delegating, and I hope to continue leading in my professional career now. In my previous job I was responsible for supervising a team of five, including managing their schedules, training them and mentoring them. I enjoy leadership and am proud to say that two of these five people were promoted while I was mentoring them. In my job before that, I supervised a team of three Designers on certain projects. I wasn’t their direct manager but they reported to me for the projects I led. So I have a mix of project management experience from that role, and direct management experience from my most recent job. I enjoy both. Now you need to come up with your own examples of leadership experience to share in the interview. Think about where you’ve led, what you’ve learned, and which story will be most relevant to the employer. Remember the first thing we discussed: Your example of leadership experience should be as relevant as possible, somewhat recent, and impressive overall. If that doesn’t sound familiar, go back to the first half of the article where this is mentioned. And whatever example of past leadership experience you choose to share, be ready to get specific and share real results. What was the outcome and what did you learn? 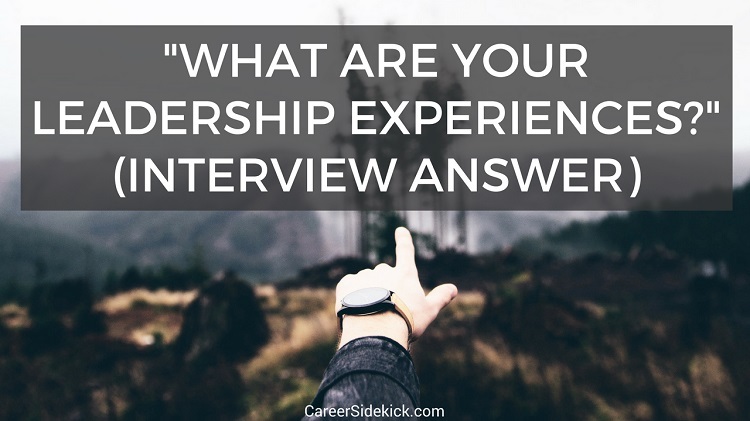 Any time an interviewer is asking this, there’s a good chance they want to hire a strong leader. So you need to sound like you enjoy leading and are comfortable doing more in the future!